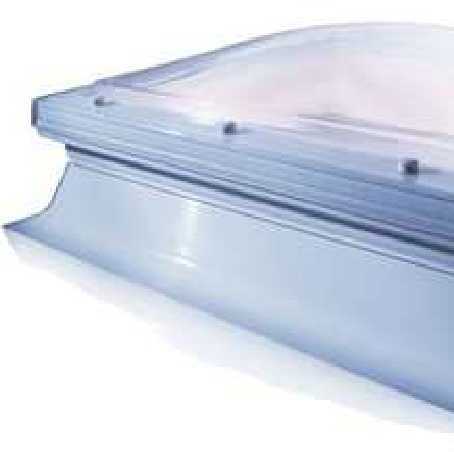 These roof-lights are supplied as a cellular PVC kerb and a pre-drilled glazing unit allowing the installer to screw fix the glazing to the kerb. The pre-drilled fixing holes are positioned using state of the art cutting technology ensuring a reliable and accurate fit every time. Once installed, security caps encase the fixings for additional security. The security caps are designed to improve waterproofing and reduce the likelihood of forced entry through the roof-light. The security caps are extremely difficult to remove after installation. They are available in either single, double or triple skinned options. The single skin is only available in a clear tint. The kerb is designed to provide exceptional waterproofing integrity. Water ingress is virtually impossible as the waterproofing membrane can be applied to the full kerb height and finished on the top horizontal surface. Hit/Miss is a trickle vent. AHC is automatically controlled by humidty-sensitive strips. It does not require an electricity supply. Ventilation Options only available to be added to a manually operated vent. Other sizes are available. If you require any of these options without a kerb either look at the reflex range or phone or email for availability. I would recommend your affordable products (Mardome Trade Dome with sloping kerb | MardomeTrade - Fixed Dome with sloping kerb with Manual Vent | Mardome Trade - Fixed Dome with sloping kerb, Manual Vent, 1200mm x 1200mm) to anyone else considering this product, as it has been superb. Omega Build Shop | Mardome Trade Dome with sloping kerb | MardomeTrade - Fixed Dome with sloping kerb with Manual Vent | Mardome Trade - Fixed Dome with sloping kerb, Manual Vent, 1200mm x 1200mm. You are viewing Mardome Trade Dome with sloping kerb | MardomeTrade - Fixed Dome with sloping kerb with Manual Vent | Mardome Trade - Fixed Dome with sloping kerb, Manual Vent, 1200mm x 1200mm, buy online today!